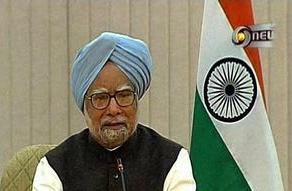 Prime Minister Manmohan Singh has announced Rs 1,000 crore for disaster relief measures in flood-devastated parts of Uttarakhand where 102 persons have been killed and thousands left stranded at tourist spots and pilgrim centres. Dr. Singh, who undertook an aerial survey of rain-ravaged Uttarakhand alongwith UPA chairperson Sonia Gandhi, said what they saw was “most distressing” and the priority for the authorities was to rescue the stranded and provide succour to those most in need of it. Over 10,000 personnel of the armed forces, 18 helicopters and a transport plane of the Air Force have been deployed for relief and rescue operations in the state where thousands have been stranded at tourist spots and pilgrim centres. “What Chairperson UPA and I saw today was most distressing. While the most recent estimates put the death toll at 102, it is feared that loss of lives could eventually be much higher,” Dr. Singh told reporters in New Delhi. He said more than 10,000 people have been rescued and were being provided food, clothing and shelter. “Many persons still remain stranded. The maximum damage has been in Kedarnath and its vicinity,” he said. “I have decided to provide an amount of Rs 1000 crore to Uttarakhand for disaster relief, of which Rs 145 crore is being released immediately,” Dr. Singh said after a meeting with state Chief Minister Vijay Bahuguna. Dr. Singh said he has also directed all Central Agencies to render all possible assistance in their domain to the State. The Prime Minister announced ex-gratia assistance of Rs two lakh each to the families of those who have lost their lives and Rs 50,000 each to those injured. In addition, ex-gratia assistance of Rs one lakh each would also be provided to those whose houses have been completely destroyed and Rs 50,000 each to those whose houses have been damaged. The Prime Minister said he and Gandhi saw the large scale devastation that has been caused in the flood affected areas of Uttarakhand. “Our hearts go out to the families of those who have lost their lives and those who have suffered injury or loss of property in this huge tragedy,” he said. Dr. Singh said assessing the magnitude of the losses, both in terms of lives lost and houses destroyed, or the damage to buildings, roads and other infrastructure, was an exercise that will take some more time. “The priority for the authorities at the moment is to rescue the stranded and provide urgently-needed succor to those most in need of it,” he said adding the central and state governments have deployed all possible resources to deal with the immediate aftermath of the ghastly tragedy. “The immediate need is for rescue and relief operations and the government will not spare any effort in this regard,” Dr. Singh said. He said about 5,500 jawans and officers of the army, 3,000 men of the Border Roads Organisation and 600 ITBP personnel were engaged in relief and rescue efforts. Thirteen teams of the National Disaster Response Force have also been deployed, Dr. Singh said adding the Air Force has deployed 18 helicopters and a C-130 aircraft. Private helicopters have also been engaged by the state government.